Hello Creatives! Welcome to the Watercolor Tips & Techniques Series, today I'm going to talk to you about brushes. 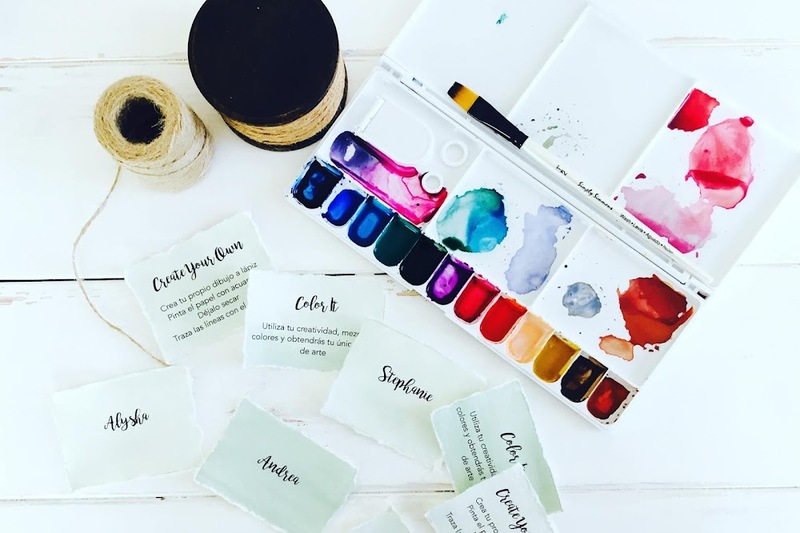 This topic was requested by a member of The Artsy Boho Tribe, and let me tell you, I'm super excited to go more in depth into this important tool of watercolor painting. You know that feeling, when you're starting out a new creative adventure, you are so excited to go to the art store to purchase the materials you need, and then you start to feel overwhelmed about all the different types of paints, papers, mediums... Well the same thing happens with brushes, and let me tell you, I've been there felt that too. When it comes to brushes, the different kinds, sizes, materials of bristles & brands to choose from are way too varied and it could be kinda confusing if you are a beginner, that's why I wanted to create this series, to help you be a pro when it comes to buying brushes and using them too. So without further ado, let's dive into the Watercolor Tips & Techniques Series: Brushes. Flat Wash Brushes: This type of brush is perfect for painting large areas and to do (yeah, you guessed it!) washes by laying the brush flat on the paper. With a flat wash brush you can also make some cool marks with, with the tip of the brush you can paint linear patterns and the geometric shapes because of its square flat tip. Round Brushes: This brushes, to me are the most versatile of all, you can paint an entire piece with just one round brush, at least that’s how I roll. Round brushes make a varied of marks, since they have a fine tip, if you barely put pressure on the brush you can make a very thin line with the tip, if you put pressure on it and lay it flat in the paper, you can create a thicker line. You can also alternate the pressure, to create line variation. Also, round brushes are great for painting almost anything you want like for example: seascapes, galaxies, trees, crystals and much more if you use sizes 6 & up. You can also paint tight corners and do fine details with them, like leaf veins, crystal cuts, highlights, among other cool things if you use sizes from 00 to 1. There are a few different materials that make the bristles of brushes different from one another, from taklon, natural hair, synthetic even squirrel bristles (yeah, that’s a thing), the possibilities are almost endless. The material of the bristle is super important depending on the medium you’re using, and I know you kinda figured it out by now, but also depending of the type of bristle, the higher or lower the cost of the brush will be. With watercolors, synthetic brushes are the way to go if you’re looking for a durable brush that will hold water and paint well and that won’t break your wallet. I personally use synthetic brushes for my watercolor paintings, and most of them I have them since last year, and they still perform like new. It’s super important to know your brushes before starting to work on an art piece, this is because you want to make sure that while you’re painting, if you need to create a specific line, or reach a very tight corner, you know how your different brushes perform for the different tasks, so that you don’t end up ruining your masterpiece. Every time I purchase a new brush, I do different test with it in a scrap piece of paper, to see the marks it can make, how it works for details, and how much paint it holds. I suggest you play with your brushes and explore all the things you can make with them, to make your creative journey with watercolours much easier. I don’t recommend super cheap dollar store brushes, some of them are made of plastic bristles that will not hold water, the marks could look streaky and the bristles can fall which can be frustrating and you end up replacing your brushes constantly, which can become expensive in the long run. With that said, I recommend brushes that are fairly priced, and is not for the price, it’s for the quality of them. To fit this description, the Simply Simmons Brushes are the way to go, the price is super affordable and if you get them on sale at Michaels or Amazon, they become even more affordable. This brushes are the ones that I mostly use, if you check out my Instagram account you can see them featured in most of my pics (HINT: They are the pearl white brushes with the orange brownish tip). If you become a more serious artist, and want to explore with more professional brushes I recommend buying the Winsor & Newton and the Grumbacher brushes, the quality is amazing. I use a lot the Winsor & Newton ones, I purchased a pack on Amazon when they went on sale last Christmas. I also have some Grumbacher ones that I purchased with a coupon at Michaels, they are pricey, but definitely worth it, as they glide on the paper like you are painting on a cloud. Bottom line, if you have a bit of money to spend, I suggest you save it and wait for a sale to happen at your preferred art store to purchase good brushes, it will make all the difference when you paint and it will save you from getting frustrated. The bigger the brush, the more area you will cover, the smaller the brush, the more detailed you can get with it. Also bigger brushes hold more paint, which means that you can paint large areas without having to dip your brush in paint and water, on the contrary a smaller brush will hold less paint, which will result in having to dip your brush in paint and water very frequently. Hope you find this mini guide useful, see you at the art store!